B & H Engineering, P.C. has provided construction support services to the New York City Department of Transportation for the Demolition of the Washburn Company Bridge. 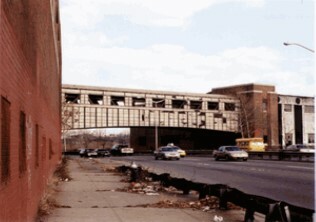 The Washburn Company Bridge consisted of two simply supported trusses spanning between two buildings on each side of the FDR Drive at 117th Street. The floor system consisted of concrete encased stringers and floor beams. The bridge was completely enclosed by stucco side paneling and a concrete roof. The construction support services included the following: review of the contractor's demolition procedures, and contractor's proposed loading, shop drawing and electrical catalog cuts, protective shielding, and temporary supports for the trusses. The project involved removal of the existing bridge, closing the openings left building wall at both ends of the bridge, and the installation of a new cantilever sign structure.